Audio exhibition, Newcastle-upon-Tyne June 2004: recordings from a 7-day trip to Sarajevo, Bosnia, using a Sanyo Digital Minidisk Recorder with amplified microphone. “Dear Bob – Letters from home 1930-1931” by May Gill was originally a slim volume of fictional letters written in the 1930’s by May Gill to her son Bob serving in the Royal Navy. May Gill is in fact George Herbert “Bert” Ward, legendary octogenarian, retired economics teacher and long-term resident of Middlesbrough in North East England. 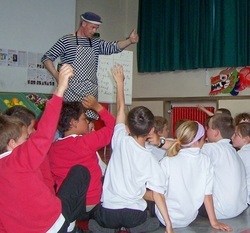 Bert created his stories at a creative writing course held by local writer Andy Croft. I stumbled on the volume, published by Mudfog Press, in the late 1990’s and immediately realised its potential with its enormous detail of everyday working class life as well as its humour and compassion. At first I tried to adapt it for radio but that didn’t work, so then I tried to adapt it for the stage and that didn’t work either! So I forgot about it for a couple of years until I eventually teamed up with Newcastle filmmaker Jacqui Scollen in 2005. She and I managed to raise £5000 towards the production of the film. We auditioned Helen Speed in the speaking role of May Gill and recorded a seasonal selection of the stories at Studio 64 in Middlesbrough in the summer of 2005. The film then played to about 10,000 people over six weeks at a tiny 1930’s replica cinema at the Dorman Museum. Owing to contractual difficulties we withdrew the film but retained the rights. My own job, as well as helping raise the money, was selecting the texts and directing/producing Helen’s voice. The 27-minute film is broken down into three parts of about 9 minutes each.